Basho stands today as Japans most renowned writer, and one of the most revered. Wherever Japanese literature, poetry or Zen are studied, his oeuvre carries weight. Every new student of haiku quickly learns that Basho was the greatest of the Old Japanese Masters. Yet despite his stature, Bashos complete haiku have not been collected into a single volume. Until now. To render the writers full body of work into English, Jane Reichhold, an American haiku poet and translator, dedicated over ten years of work. In Basho: The Complete Haiku, she accomplishes the feat with distinction. Dividing his creative output into seven periods of development, Reichhold frames each period with a decisive biographical sketch of the poets travels, creative influences and personal triumphs and defeats. Scrupulously annotated notes accompany each poem; and a glossary and two indexes fill out the volume. Reichhold notes that, Basho was a genius with words. He obsessively sought out the right word for each phrase of the succinct seventeen-syllable haiku, seeking the very essence of experience and expression. With equal dedication, Reichhold sought the ideal translations. 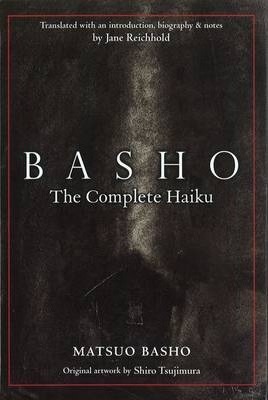 As a result, Basho: TheComplete Haiku is likely to become the essential work on this brilliant poet and will stand as the most authoritative book on the subject for many years to come. Original sumi-e ink drawings by artist Shiro Tsujimura complement the haiku throughout the book.